What's an extra inch in height worth? A new study finds it could mean up to $800 a year in extra income. 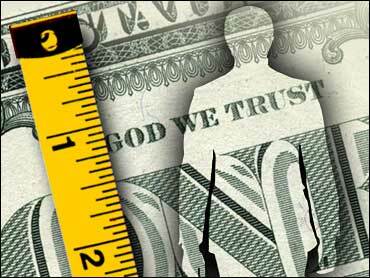 Researchers at the University of Florida and the University of North Carolina found that tall people tend to earn more money and win more respect at work. They found a height advantage even in jobs where being tall isn't a qualification — in other words, they didn't just look at pro basketball players. The study followed thousands of people in the U.S. and Britain from childhood through their adult earning years, accounting for both subjective evaluation and objective worker performance. However, the researchers didn't find any obvious bias against shorter people. They say we may have been wired to think in favor of tall people thousands of years ago, when those people would have been looked to for protection. But the researchers also say being short doesn't appear to be a prohibitive disadvantage. Hard work, motivation and intelligence help bridge the gap. The study is scheduled to be published in the spring issue of the Journal of Applied Psychology. By the way, Napoleon really wasn't as short as "common wisdom" says. After his death in 1821, he was measured at 5-foot-2, but that was in French feet. In English feet, that converts to 5 feet 6½ inches, actually taller than the average Frenchman in 1800. As Napoleon himself said, "History is a set of lies that people have agreed upon." © 2003 CBS Interactive Inc. All Rights Reserved. This material may not be published, broadcast, rewritten, or redistributed. The Associated Press contributed to this report.